BOXX Technologies, a leading provider of digital content creation systems for the entertainment and digital film industries, announced today its new 3DBOXX S2 series of workstations based on the new Intel® XEON® processors operating at 1.7 GHz. 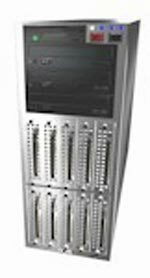 Designed for Microsoft Windows 2000, Windows NT or Linux, the 3DBOXX S2 workstations are optimized for leading 3D and animation software programs such as Maya, 3D Studio MAX, Softimage 3D, LightWave 3D and Houdini. BOXX® Technologies, headquartered in Austin, TX, is a leading developer and manufacturer of high-performance, high-bandwidth Microsoft Windows NT, Windows 2000 and Linux-based hardware and software solutions for the 3D, animation, digital film, and HDTV broadcast markets. BOXX solutions are designed to increase productivity and performance and include 3DBOXXTM, RenderBOXXTM, HDBOXXTM, CineBOXXTM, ServerBOXXTM, and RAIDBOXXTM- all complete systems for 3D, rendering, HDTV, digital film playback, server solutions, and high-capacity storage, respectively. Boxx Technologies, 9390 Research Blvd., Suite 300, Austin, TX 78759. Tel: 877-877-2699; Fax: 512-835-0434.